After Monday’s unfortunate rain out of opening night, Bargemusic took the stage at Fall Festival yesterday. A lively combination of classical and jazz music was performed by musicians who regularly play on the barge, the NEOS String Quartet, pianist, Steven Beck, the Voxare String Quartet, and the Fireworks Ensemble. Concert highlights included the Fireworks Ensemble’s expertly executed excerpts from jazz pieces commonly heard in old Looney Tunes cartoons. Be sure to visit the park tonight at 6pm, when the New York Gilbert & Sullivan Players take the stage to perform selections from musical theater classics like Pirates of Penzance, The Mikado, Ruddigore, I’ve Got A Little Twist, and more. 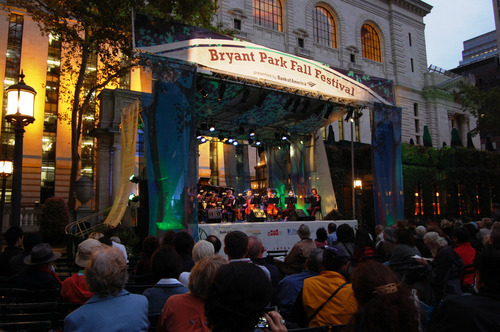 Visit BryantParkFallFestival.org for the complete Fall Festival line-up because there’s still opera, dance, and more jazz and classical music to come! For frequent updates, special offers, and prize giveaways (like WNET Thirteen’s Fall Festival VIP Giveaway Contest), become a fan of Fall Festival on Facebook or follow Bryant Park on Twitter.